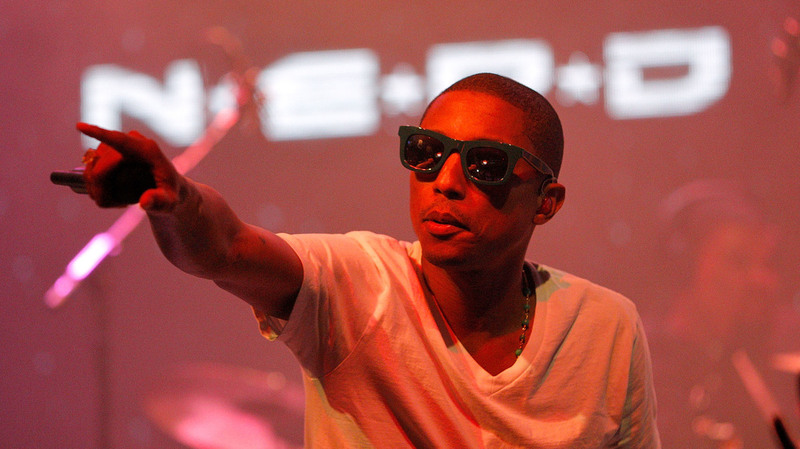 Pharrell Addresses The Killing Of Keith Scott By Police On New N.E.R.D. Album : The Record N.E.R.D. premiered the new album — featuring Andre 3000, Kendrick Lamar, Ed Sheeran and more — Saturday in Long Beach, California. N.E.R.D. 's new album will mark the first LP by Pharrell Williams, Chad Hugo and Shay Haley since 2010's Nothing. Coming from anyone other than the superproducer Pharrell Williams, that might've sounded like the opening incantation of some esoteric religious experience. But on Saturday night, Williams' pulpit was ComplexCon, where his genre-bending band N.E.R.D. made a surprise reveal. Two days after returning from a seven-year hiatus to release the lead single and video "Lemon" (featuring Rihanna), Williams, Chad Hugo and Shay Haley took the stage of the Long Beach Convention and Entertainment Complex to premiere the new album, No_One Ever Really Dies, in its entirety. "For all the people that really love us, we wanted to give you something that you really respect," Pharrell continued, encouraging the crowd to document the preview. "The album's not coming out tomorrow. We giving it to you. You'll be able to stream it, but you guys, everybody in here with a f***** phone right now, it's yours. This is your moment." What proceeded was essentially an elaborate listening party meets live performance art. Dancers — including the star of the "Lemon" video, Mette Towley — pranced on top of cars parked onstage. Meanwhile Pharrell, Haley and Hugo, freshly dipped in apparel from their new 88-piece capsule collection adidas by N.E.R.D., chilled on a van near the back. The N.E.R.D. listening seemed to take cues from Kanye West's Yeezy Season 3 fashion reveal, which doubled as the premiere of his last studio album, The Life Of Pablo, in 2016. As each of N.E.R.D. 's new songs ended, a robotic, feminine voice announced the next track, while rolling out an all-star list of featured artists: Andre 3000, M.I.A., Gucci Mane, Wale, Future, Ed Sheeran, Rihanna and Kendrick Lamar, who appears on two tracks. One of the songs on which Lamar appears, "Don't Don't Do It," was inspired by the 2016 police killing of unarmed black motorist Keith Scott in Charlotte, N.C. Pharrell introduced the song by recalling what it was like to watch the video, knowing it would end in Scott's death. It was in the pleas Scott's wife made to police — "Don't, don't do it!" — that Williams heard the beginnings of a tragic ballad. "I thought to myself: 'She knows her husband is gonna die,'" Williams says. "And I knew in my mind, man, that's a chorus. The only thing that video is missing is melody and music." Though Williams alluded to the album being available on streaming platforms very soon, it has yet to appear and an official release date has not been revealed. Other highlights from day one of ComplexCon — the annual convention put on by the online publishing company of streetwear, hip-hop and pop culture, Complex — included Andre 3000's custom-designed Tretorn Nylite 50 sneaker, the sale of which will help benefit a charity for young, at-risk artists, after its auction on eBay.